We’re proud to introduce a new everyday discount of 10% to EBT shoppers! In the San Francisco Bay Area it’s really hard to live a healthy lifestyle and make ends meet. That’s why Rainbow Grocery Cooperative workers collectively decided to offer a 10% discount to the most economically disadvantaged community members among us. Tell your cashier you are paying with EBT before you swipe your card. For those of you who are unfamiliar, EBT stands for Electronic Benefit Transfer. Those who receive CalFresh (what we used to call “food stamps”) or General Assistance benefits from the State of California are issued an EBT card to access those funds. 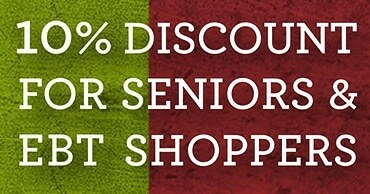 We also continue to offer a 10% discount to all shoppers who are 60 years old and up, as well as great bulk discounts in Vitamins and Bath and Body.